Diva magazine also hits the newstands this week, featuring a two page spread on Crush and a competition to win tickets for the show. And today we heard that another track - featuring Rosemary Ashe as our tyrannical headmistress Miss Bleacher - will be played on the Elaine Paige show on the 20th September. Dame Dorothea would be very proud! Bad Girls The Musical hits the big 100! Bad Girls The Musical reaches 100 amateur productions! Encore Productions in Runcorn will stage the 100th amateur production of Bad Girls The Musical since the rights to the show were made available through Weinbergers in 2009. Since then there have been productions throughout the UK as well as internationally in The Netherlands, Sweden, Belgium, Spain, New Zealand and Australia. Encore Productions are among several groups who’ve had so much fun being bad that they’ve had to do it twice! 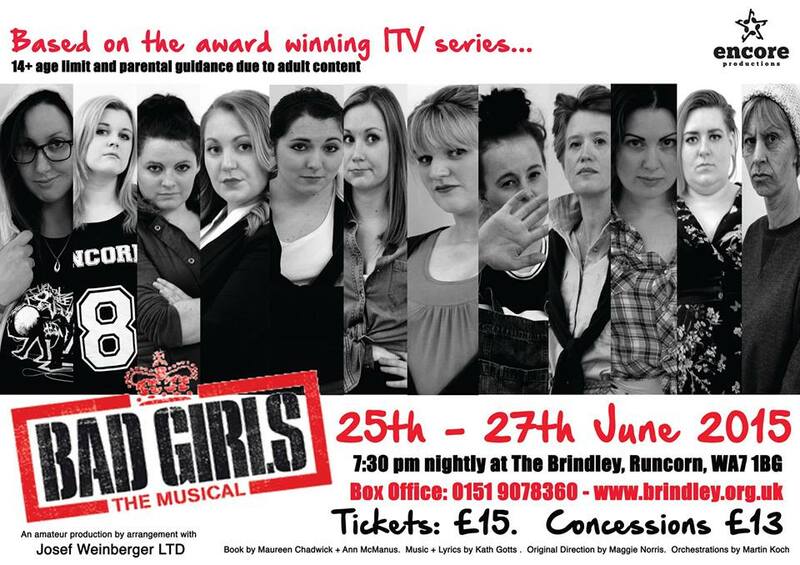 Their production of Bad Girls The Musical will run from 24th-27th June at the Brindley Theatre in Runcorn. And from July 2015 the original West End production of Bad Girls The Musical will be available to view online through Amazon Instant Video. More news soon.